The following manifesto was issued by a group of anarchists during their trial in Lyon, France in 1883. Over 60 suspected anarchists were charged with belonging to the International Workers’ Association (the First International: Anarchism, Volume One: From Anarchy to Anarchism (300CE-1939), Chapters 5 & 6 ), which had been banned following the suppression of the Paris Commune (1871: Anarchism, Volume One, Chapter 7).The signatories included Peter Kropotkin, Emile Gauthier, Joseph Bernard, Pierre Martin and Toussaint Bordat. The picture above shows Kropotkin cross-examining the Lyon chief of the French secret police. Despite the lack of any real evidence, the accused were convicted as charged. 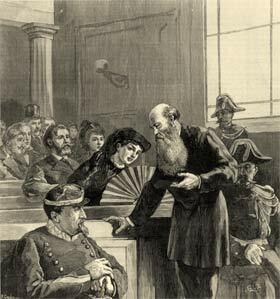 Kropotkin and three co-accused were sentenced to 5 years’ imprisonment, 10 years of police surveillance, deprivation of their civil liberties for 5 years and fines of 1,000 francs each. The others received lesser sentences. Kropotkin’s experience in prison is recounted in his book, In Russian and French Prisons (1887). What is anarchy and what are the anarchists? Anarchists are citizens who, in a century where freedom of opinion is preached everywhere, have believed it to be their right and duty to appeal for unlimited liberty. Throughout the world there are a few thousand of us, maybe a few million, for we have no merit other than saying out loud what the crowd is thinking. We are a few million workers who claim absolute liberty, nothing but liberty, every liberty. We want liberty; we claim for every human being the right to do whatever he pleases and the means by which to do it. A person has the right to satisfy all his needs completely, with no limit other than natural impossibilities and the needs of his neighbours, which must be respected equally with his. We want freedom, and we believe its existence incompatible with the existence of any power whatsoever, no matter what its origin and form, no matter whether it be elected or imposed, monarchist or republican, inspired by divine right, popular right, holy oil, or universal suffrage. History teaches us that every government is like every other government and that all are worth the same. The best are the worst. In some there is more cynicism, in others more hypocrisy, but at bottom there are always the same procedures, always the same intolerance. There is no government, including even the ones that appear the most liberal, which does not have in the dust of its legislative arsenals some good little law about the [First] International to use against inconvenient opposition. Evil, in the eyes of anarchists, does not dwell in one form of government more than any other. Evil lies in the idea of government itself. The principle of authority is evil. Our ideal for human relations is to substitute free contract, perpetually open to revision or cancellation, in place of administrative and legal guardianship and imposed discipline. Anarchists propose teaching people to do without government as they are already learning to do without God. Anarchists will also teach people to get along without private ownership. Indeed, the worst tyrant is not the one who locks you up; it is the one who starves you. The worst tyrant is not the one who takes you by the collar; it is the one who takes you by the belly. No liberty without equality! There is no liberty in a society where capital is monopolized in the hands of an increasingly smaller minority, in a society where nothing is divided equally, not even public education, which is paid for by everyone’s money. We believe that capital is the common patrimony of mankind because it is the fruit of the collaboration between past and present generations, and that it ought to be put at the disposal of everyone so that no one is excluded and no one can hoard one part of it to the detriment of others. In a word, what we want is equality. We want actual equality as the corollary of liberty, indeed as its essential preliminary condition. That is what we want; that is what our energies are devoted to. It is what shall be, because no limitation can prevail against claims that are both legitimate and necessary. That is why the government wishes to discredit us. Scoundrels that we are, we claim bread for all, knowledge for all, work for all, independence and justice for all.